Kitty cats, to your left you will find Balmain’s blissful Stretch Urban Studded Gladitors – the very same ones seen styling the feet of Lindsay Lohan and Rihanna; to the right prepare to fall in lust with Type Z’s tantalizing Lorry. While the luscious Lorry has an ever so slightly higher heel than the Balmain beauties; for a mere $100.00, as opposed to the $1,025.21 price tag of the Balmain’s, they are a nearly identical offering – for a fraction of the price! Thanks to My Theresa and Zappos for the pictures. Those shoes are awesome!! Definitely the Type Z ! Holy wow, they're so similar! I'd go either way! Honestly, I can't tell the difference. Cool. So cool, but a 100 bucks is still too much for me. They look so similar! And they're absolutely gorgeous. Oh my goodness! They are exactly the same!!! How do you find these things? I'd love a pair- I bet my legs would look amazing in them! They are basically the same! Except the Balmian shoes seem to have much more of a classy curve to them, they are identical! They look exactly the same, so why go for the $100 version when you can have the originals? I am always so impressed with these posts of yours! Wow, these are almost identical. I love them! They look so much alike, I think I'm content to just drop the $100! I would definitely save! (I actually don't have much of a choice!) I'm actually getting these Arturo Chiang's> they definitely differ in design, but I think they might be on the same style plane. Those Balmain ones are so stunning!! I think they would go so well with socks and a skirt. I'd definitely think the cheaper ones would be a good investment. there's just no way i could pass on anything balmain! They look identical! I'll definitely save and go with the Type Z pair! Aah, they are soo similar! And they are absolutely awesome. This may be one of your best matchups ever! They look idetical! Seriously perfect. 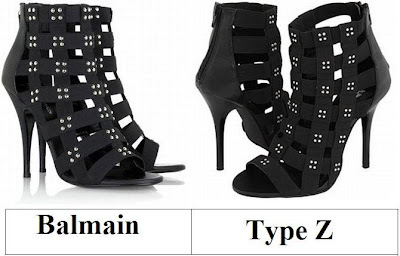 These look so alike, I just HAVE to go with the Type Z shoes! Great find,Erika! Now really, who can resist the Balmain look for less? Type Z for Me! I'll have to go with the save Erika...but I'd be going with tears and a big ol' nothing without you!! P.S Way excited to read it!!! These cage sandals have been catching my eye for a while. I adore them! The ones from Type Z are really great! I'd go for the ones with the higher heel! I think this is definitely a thrifty moment - they look so similar! i would totally wear these. they are the exact same shoes! Balmain ... I don't know why because they really do look so similar, but I like them better. Here's another one i can't decide between! both are lovely! Woah, those look exactly the same! Would probably go for the cheaper ones as they are equally gorgeous! What a gorgeous post it was. My first impression is that deserves Royalty. You have really done a great job. Truly exceptional. I believe what you have done is unique and gorgeous.